Good evening, how are you? I'm scared! Picture this if you will, for I'm about to tell you a story. No, this isn't part of the story, in fact I'm not even sure now why I started this sentence in the first place, or even this paragraph. It literally adds nothing of value, interest or usefulness. I once fell down a flight of stairs and thought the same thing of the trip. So I had just finished a university meet-up in the city with some like-minded security and privacy nutjobs. Craving a nightcap, I made my way to a local Starbucks and ordered a Chai Latte. Don't worry I'm not a hipster, I just don't really like drinking alcohol much, particularly in the centre of town late at night! But I digress. Hot beverage in hand I proceeded to the Museum train station under Hyde Park. Despite it being a fairly warm day, the evening air was cold and blustery, and the overcast sky reflected the lights of the tall buildings which scraped them. Those kinds of buildings have a specific name, but it escapes me. [Opened in 1926], Museum is a railway station on the City Circle line in Sydney, Australia, Named for its proximity to the Australian Museum, the station is located entirely underground at the southern end of Hyde Park. The station features photos depicting its past in the pedestrian tunnels and is regarded as the least used of the City Circle stations. After waiting on the platform for twenty minutes or so (surprisingly good by Australian public transport standards), the train heading for the East Hills and Airport line pulled up with a squeaking and loud hissing of its ageing brakes. With several generations of rolling stock on the network, you never know what the age of the train you'll be riding on is until it arrives. 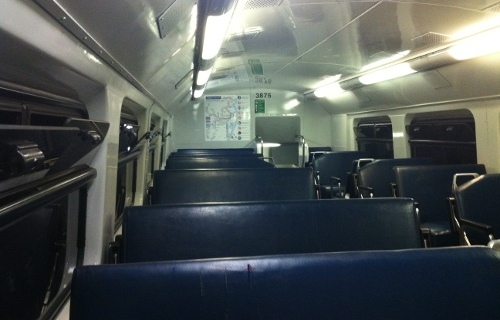 The most recent models on my line are the Millennium trains which were built around the time of the Sydney 2000 Olympics and come fitted with squishy seats, air conditioning, chopper control (for smoother acceleration) and huge windows. The train that pulled up for us this evening was an S series, amongst the oldest in the fleet having been first introduced in the early 1970s. Very retro in styling, no air conditioning and dark blue springy vinyl seats. 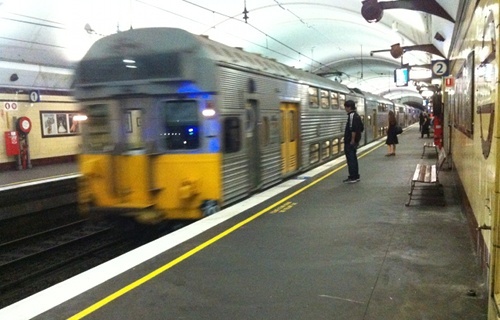 CityRail.info has graphics illustrating the difference. You get the idea. 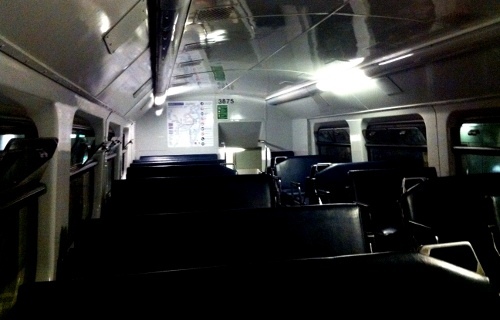 So I jumped on board and soon realised I had the entire upper deck of the carriage to myself. Given its age the train creaked as it rocked from side to side between stations, and the windows were open to let some fresh air in… air which was extremely cold I might add! Which was weird because it was so warm before. Wait, I already said that. Having departed from Museum then Central, the train made its usual way down into the Airport Line tunnel which travels underneath Green Square, Mascot and each of the domestic and international airports (surprising though it may seem!). Unlike most other subway systems that I'm used to, the Airport Line tunnel has trains running in both directions in it, so occasionally you'll see a train come out of the darkness and pass you. If you're in an older generation carriage with the windows open it can be quite noisy! Oh yeah, this was supposed to be about a scary train ride. Sheesh, talk about a needlessly long introduction! So I was in this old train rattling down this tunnel with the windows open and with the whole carriage to myself. It couldn't have been more than a few minutes into the ride, but suddenly and without warning some of the fluorescent lights in the roof started flickering. I'd be able to see the inside of the carriage, then not, then see it, then not. Finally, all the lights went off completely, and there I was cruising through this pitch black tunnel with only the light from my phone. Did I mention this train was old and creaky and made lots of noise through a combination of the windows being open in a tunnel and the old brakes and wheels and whatnot? 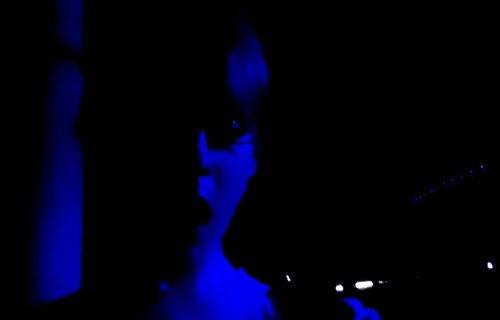 It was dark, and loud, and I was alone! Perhaps it was for safety reasons owing to the fact there were no lights, but around this time the train driver began blasting the horn at regular intervals. If you think train horns are loud normally, try hearing them in a tunnel, with the windows open, and at short regular intervals! The first couple of times the sound was so loud I jumped a little in my chair, which was one of these old fashioned vinyl seats with springs which made me even more jumpy. Wait, I already said that. Eventually three of the six florescent tubes lit back up again in the carriage and I was able to see enough again to know that I wasn't in some nightmarish ghost train or something of the sort. Of course we'd already been in the tunnel for a while, so it was only a few minutes more before we were back on the surface. The driver stopped sounding the evil sounding horn, and I was able to hear the sound of Neal O'Carroll on my iPhone again. 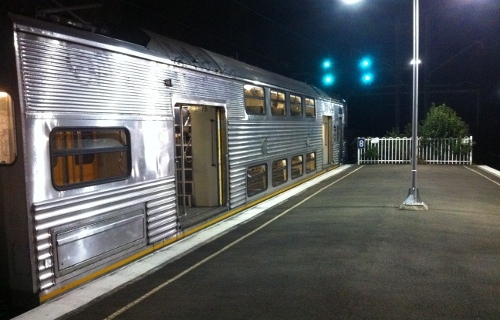 Disembarking said train at my designated stop of Bardwell Park, I noticed that I was the only one to leave the carriage I had been in, and only one other person got off at the same time as me. The station was lit up but the train was still eerily dark and for some reason just sat there for a few minutes; normally the train starts to leave as I start walking towards the street, but I was already on the overpass before it started moving again. As fate would have it, I also decided this evening to try my new shortcut I found to avoid having to go up the extremely steep hill between the station and Earlwood. I'd never ventured through it at night, but the path was overgrown with evil looking trees which cast weird shadows in the moonlight, and one of the buildings I passed had the eeriest blue lights which let me take that pointless photo below. It was too dark to be those anti-loitering tubes the current affair shows here love to talk about, maybe they were just for show or to look alien and evil. I'm inclining to think the latter. Overall a fitting end to a super creepy train ride which this post has no doubt not done justice! Older post → Trains Ruben Taketh: S70, again!